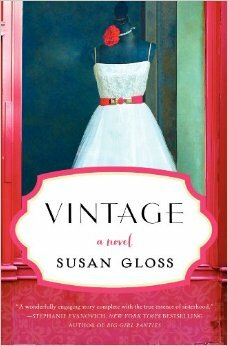 Congratulations to Susan Gloss on the launch of Vintage today! It’s a wonderful read filled with treasure for both women’s fiction fans and vintage enthusiasts, and it’ll make you want to rummage through your closet with a close friend to rediscover the stories behind the items we keep. We are so excited for you, Susan! There’s a difference between living our lives surrounded by things, and living it surrounded by stories. Growing up, I was always the sentimental type, afraid to get rid of anything I felt I’d one day look back on and long to hold once again. Old books. Clothes my mom made me that I’d grown out of. Letters from pen pals and stuffed animals gifted to me by childhood crushes. But the years and the life and the things add up, and with each move to a new home, state, or apartment, it becomes harder to decide what to leave behind and what to take with. I’m fascinated by people who are able to curate the past, people like Violet in Vintage, (and people like Susan, who runs her own Etsy vintage store) who can look and see the value beyond just the physical beauty of an object. There are objects we hold on to because they belong to someone we cared for, and they still contain a piece of their spirit. One of my favorite pieces of “inventory” in Vintage is a lime-green felt hat from the late 40s that once belonged to Violet’s grandmother. Its bright eccentricity brings Violet light, hope and strength in a dark and difficult moment. The story is full of items like this, items which are not only beautiful to the eye but to the hearts of those who once owned them. They’re the kinds of things that are very telling: they hold a past that connects them to the owner, a present that tells the story of where they are now, and an unknown future, a new life waiting for them in the hands of another. Susan weaves the stories of these objects and the people who once held them as their own in such a heartwarming way, it made me long for the random treasures I know are stored away in my mom’s attic, back home in Miami. But I do have one of those vintage items with me here in Austin. It’s a brown leather clutch that belonged to my grandmother in the 70s, which she gave to my mom, who gave it to me about two years ago. It was made by the Peruvian purse company Alda. I love it because it’s simple: perfect for day or night, easily dressed up or down. The leather is soft and worn, passed down through many hands and generations over time. What I love most is that when I wear it, I imagine what my grandmother would’ve paired it with: pearls and gloves, perhaps, and a skirt-suit down to her mid-calves. I remember what my mom used to wear it with: she had this strapless gown she wore one New Year’s Eve when I was five, with a heart-shaped neckline and bright, red and pink roses. Gorgeously glamorous, both of them. I may have lost a lot of old books and clothes as I’ve moved from home to home, but this is one item that will stay with me for a very long time…until, who knows? Maybe I’ll pass it down to another special woman in our family. Do you have any vintage treasures you could never part with? What are their stories? P.S. For anyone who has purchased a copy of VINTAGE or does so this week, Susan is running a Glamorous Vintage Giveaway for a package of vintage-themed goodies over on her blog. My sister unloads all the family junk on me because she knows I don’t have the heart to get rid of it. I keep sweaters with holes, scraps of paper that has a dead relative’s handwriting on it, even a broken lamp. I’m very sentimental, especially if the person is dead. Debi, I have become that person in my family, too! And Natalia, that is one fab handbag. I can see why all of the women in your family have hung onto it. It’s perfect. First of all, CONGRATULATIONS, Susan!!!! 🙂 Today is your day!!!!! And Natalia, I can see why you love that little purse (other than the sentimental value). It’s gorgeous!